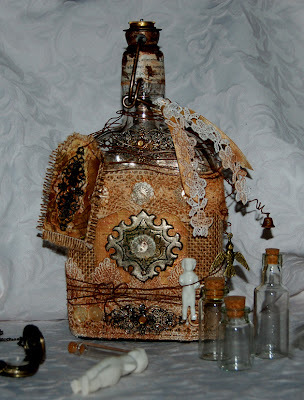 A crafting friend (Kathy) and I, got to talking about "unfinished projects"... you know the kind? you have a great idea.. get started then get a bit lost so just never seem to finish it. 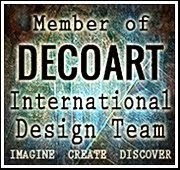 We both agreed that a second opinion was often needed for these projects. Then Kathy said (more as a joke than anything) that we should finish off each others projects. I POUNCED on the idea lol (poor Kathy). and we agreed to do a swap. 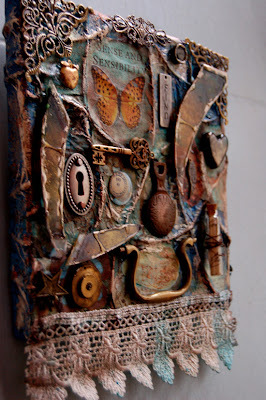 Kathy had started a string textured canvas and had got as far as the background... 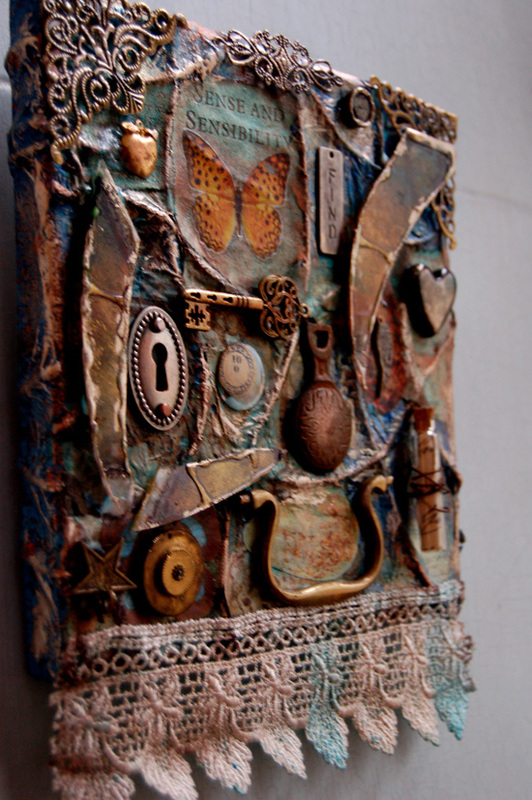 I happened to have a canvas that i had used to show a pupil how to do a particular textured background on, but had tossed it to one side never to be looked at again. so Kathy now has my canvas to work on, and I have hers. I decided to grunge Kathy's canvas up a bit and add some curios to it to give it a bit of a 'lost and found items' feel. too late I cry.. lol.. its done and will be getting posted back to her next week. Well, as a rule, I don't make cards; but after making a tag a few days ago, I felt I ought to try and make a card for mother day for my mother in law. 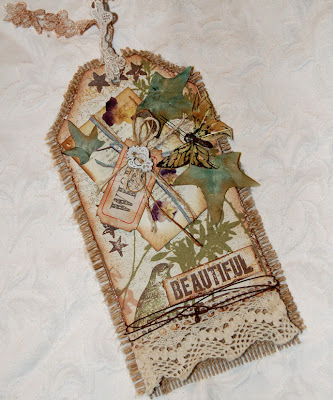 I am not sure she will "Get" a tag like a crafter "gets it" lol. So I cut a square of basic card-stock to size. I dont think it matters what colour but make sure its either the same as the folded card you are attaching it to, or a nice matching tone to the collage work. 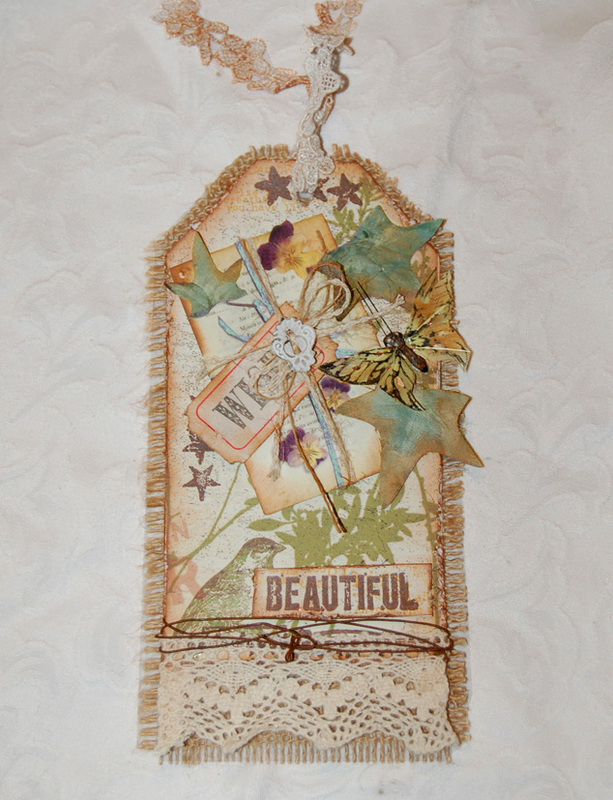 I glued on a square of 7 gypsies paper (cut from the same 12x12 sheet I made the tag from a few days ago.) glued it to the square of card stock. I distressed the edges (either sand it or run the edge of the scissors along it) and inked with the chalk ink to give it a sort of burnt rusty look. 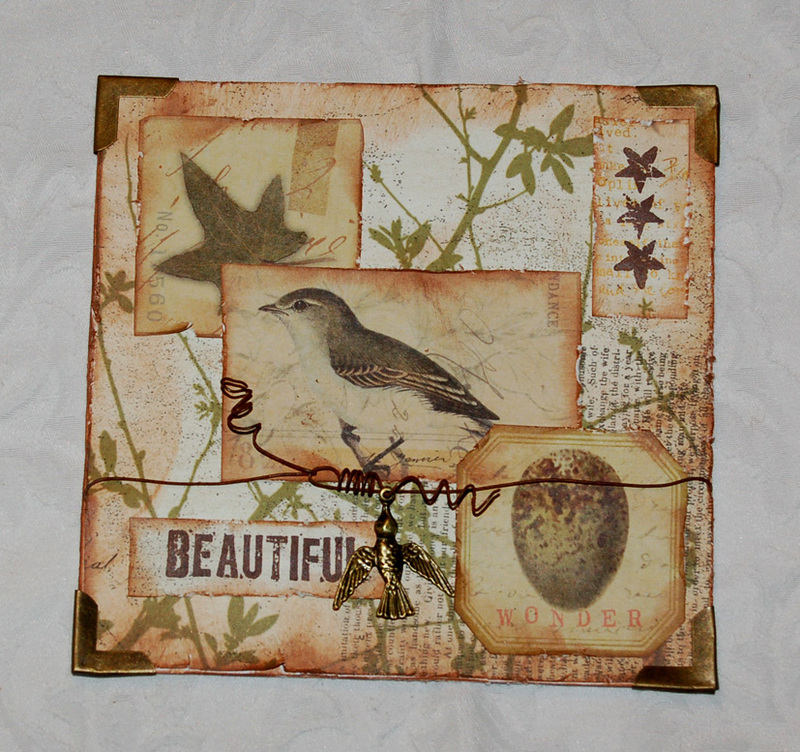 Next I cut out some panels from a 12x12 sheet of K&Co flora and fauna paper and aged them in the same way. decided on my layout and then glued them in to place. Now attach the metal corners. The panel is now ready to be attached to the main card (which should still be glue and ink free). 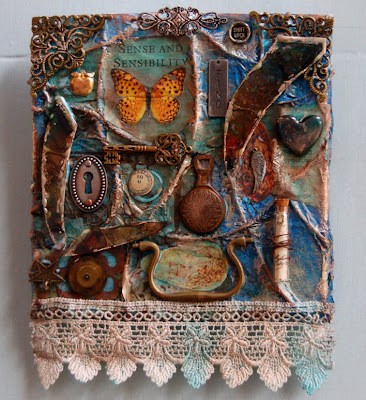 7Gypsies HERE: I used, 7 gypsies paper (off the wall), 7 gypsies metal corners, 7 gypsies "Lille" stamps. It is a pretty basic layered effect. 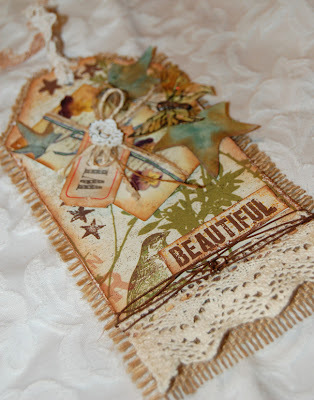 I cut the hessian (Burlap) to size, then a piece of corrugated card slightly smaller, for the basic tag. 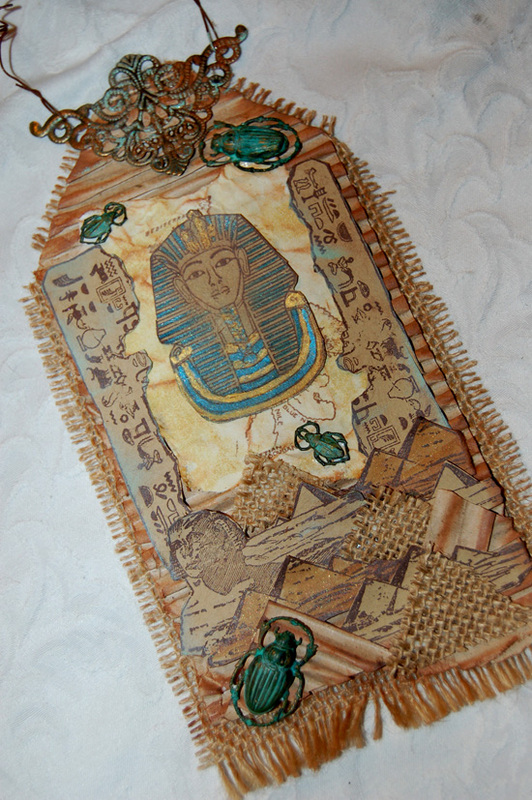 I coloured a piece of torn out paper using antique linen and scattered straw, distress ink, then I stamped the Egypt map out on to it. 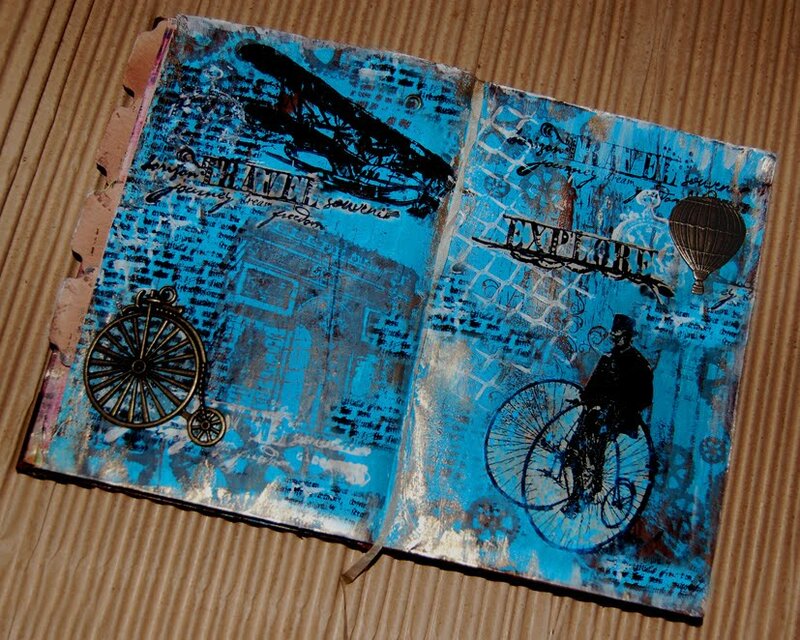 i further distressed it with gingerbread coloured versamagic chalk ink. 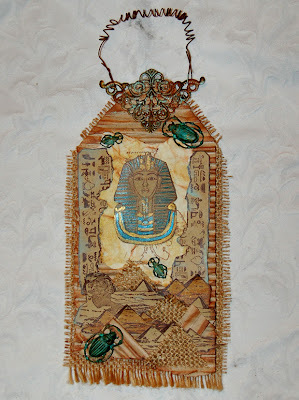 I also stamped out and coloured / distressed the hieroglyphs and Tutankhamen's mask. 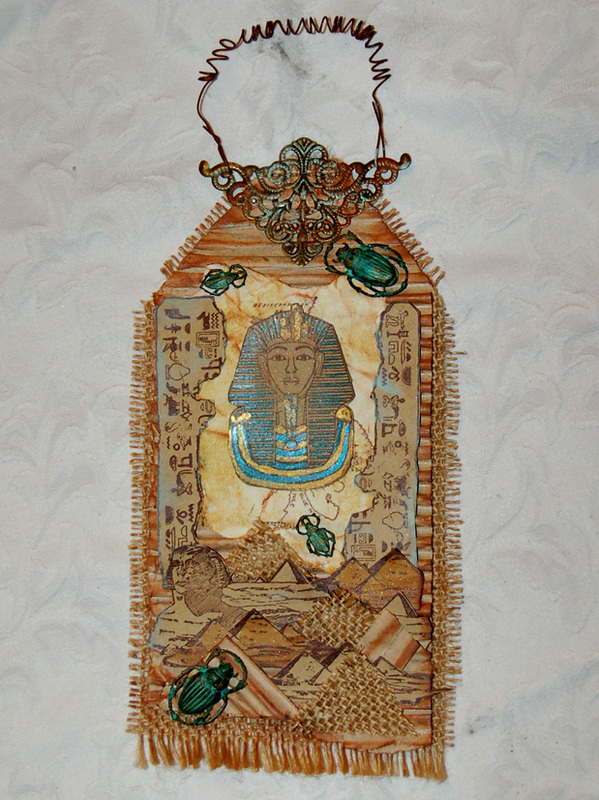 The layered pyramids and sphinx at the bottom are stamped on kraft card and some have been coloured using distress inks. some have been left neutral. 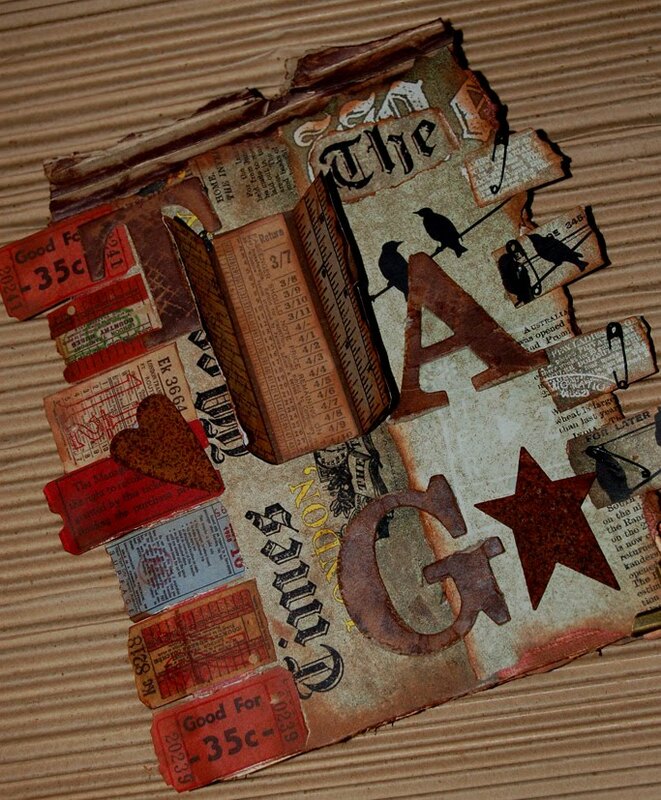 I cut them out and layered them up randomlu adding some little hessian and corrugated card pyramids in between. 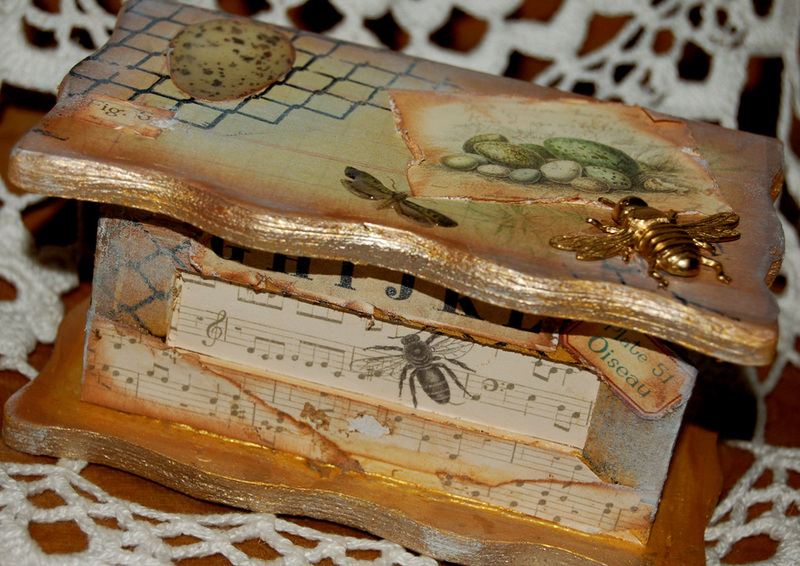 The rest is just glue and embellishments; 4 metal scarabs and an ornate filigree corner with a piece of rusty wire threaded through it. Nature tag For Calico crafts. I used some 7 gypsies papers and stamps to make this jumbo tag. I don't make cards very well so decided to make a tag for my mother in law for mothers day. i have put a fresh piece of cream card-stock on the back so we can write a message. 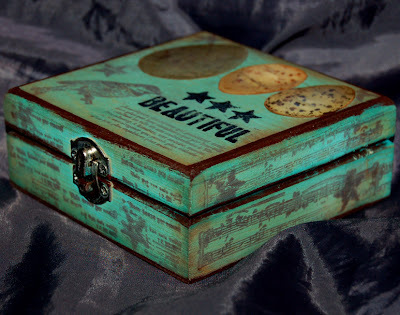 I aged everything in the usual fashion, some gingerbread and jumbo java chalk inks blended round the edges and I stamped the word and stars out in jumbo java. 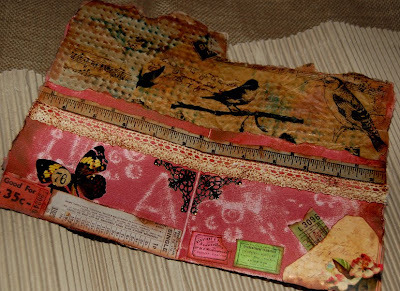 The main backing is 7 gypsies paper cut from a sheet of 12x12... the little wrapped letter is from the K&Co ephemera pack (flora and fauna) which, despite making several art journal pages and a few other projects using bits from the pack, seems to be lasting me ages. The small ivy leaf is also from the ephemera pack and the larger ones are cut from the ivy wreath available in the floristry section. 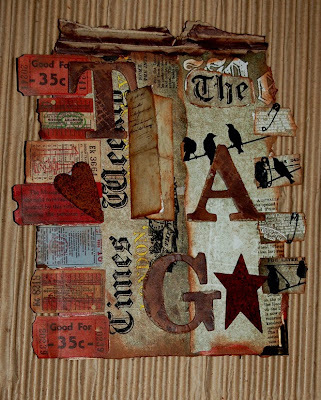 there is a teeny wee keyhole in the center of the "tied letters" from the Malissa Frances, Vintage Attic range. I tucked a "WISH" ticket in to the twine i tied around the image of the tied letters. (My sons girlfriend brought me a whole roll of wish tickets back from her trip to San Fransisco. very cool. 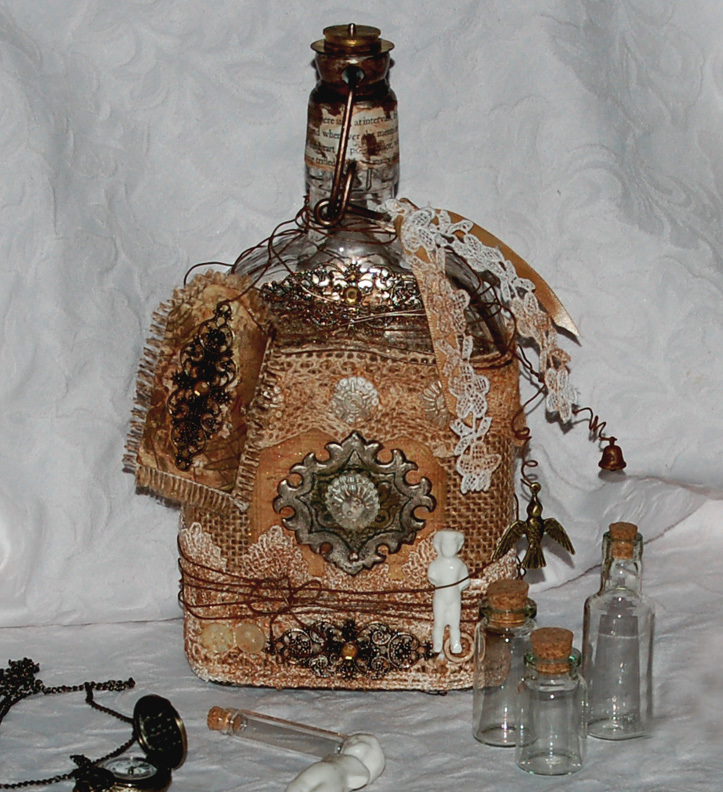 I have used some rusty wire around the bottom and cream/ivory lace. The whole tag was mounted on to hessian (or Burlap as Mr Holts would say) and a piece of embroidered guipure daisy trim was threaded through the whole at the top. Final touch was a wee feathered butterfly. I think thats it... I'm a bit disorganised in the old noggin at the moment so probably gave a disorganised description , but I am sure you get the gist. Well I found some nice glass bottles at "lakeland" for under £5 so bought a couple to alter. I had imagined a lot of ink. paint and texture paste, but as i still cant really work in my craft room and have to work on the coffee table in the sitting room I ended up going for a cleaner "cut and glue" alteration. I've added two photos although neither are correct in colour or tone... they just oth have a different flash setting. the actual item is less saturated in colour than the top picture but not as wishy washy as the bottom. 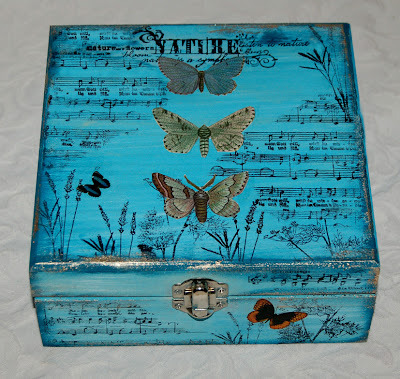 Well its the fifth week of the "Calico Crafts" design team blog already and I am back with my third project. 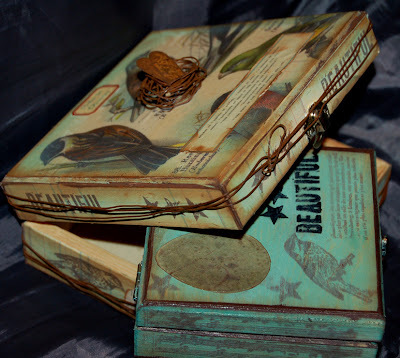 I bought a set of the wooden boxes, which I think are great value considering you get 4 in the set. I have split the set up and put the two smallest together for a matching pair of bird and bird egg themed boxes. I will start with the larger box then tell you about the smaller box. I used a sheet of 7 Gypsies paper from the conservatory range to cover the box in sections. 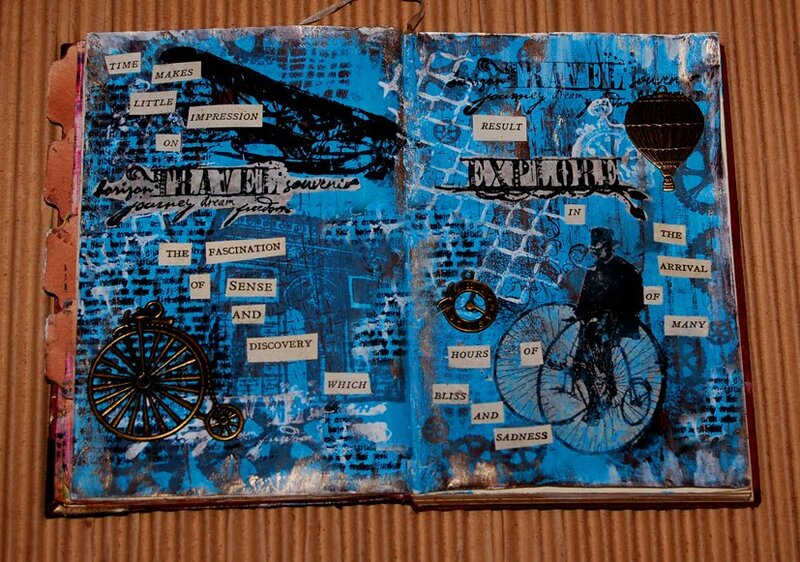 I saved some of the details like the text and the eggs to cut out and layer on over the top in a collage style. I did this to make sure there were plenty of points of interest on all faces of the box. 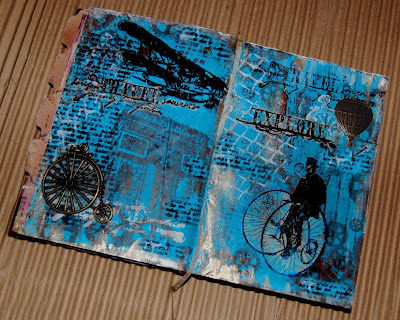 Once the glue had dried I began to shade and distress the paper using Versamagic Chalk inks. I started by going around all the edges with the "Sea Breeze" shade. I let it blend quite far in to the paper, letting it spread for about an inch in from the edges. next i did the same (working around the edges) with the "gingerbread" shade, but I only let that blend in from the edge for maybe a centimeter (I am mixing my metric with my imperial here) So I can still see some of the sea breeze showing . The gingerbread shade adds a sort of rusty aged look. 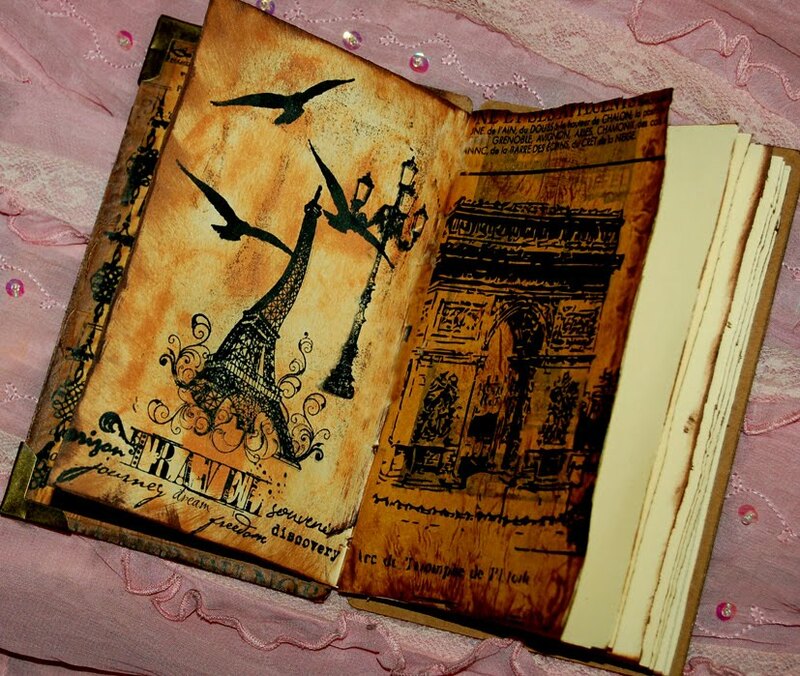 (if rubbed along the edge of torn paper it can give a nice scorched burned look too.). Lastly I used the "Jumbo Java" shade to lightly rub along the very edge, so that it only just shows up. 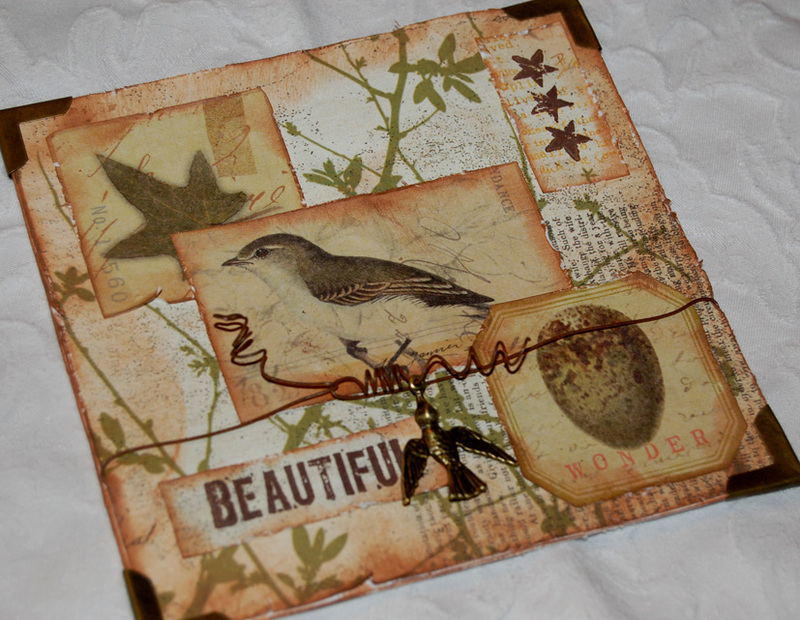 The chalk inks have a really nice gentle soft look about them and blend beautifully. I hardly get a project done without using them at some point. Next came the rubber stamping along the sides of the box. I used the 7 gypsies stamps from the Lille range and just repeated the pattern slightly, using the three stars, the bird stamp and the word "Beautiful". 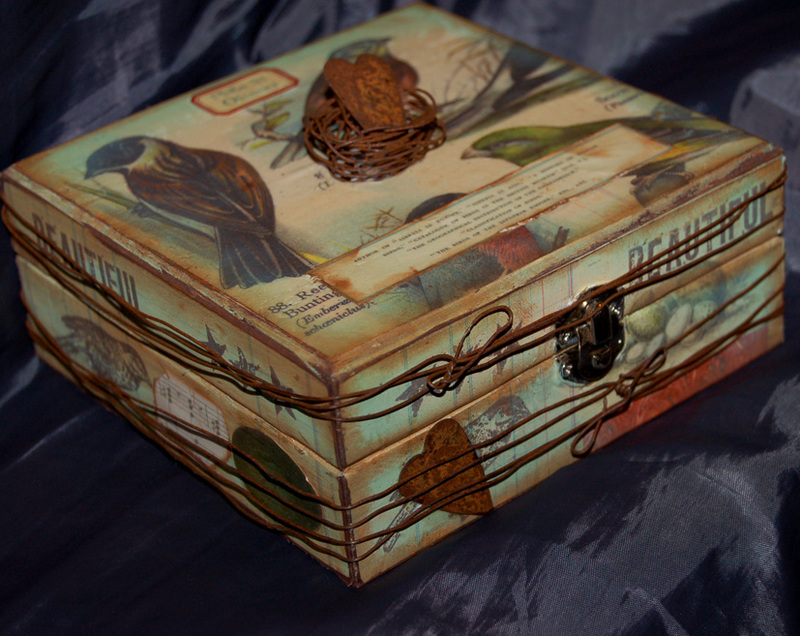 I added the rusty wire around the outside edges and made a rusty wire nest for the top of the box. 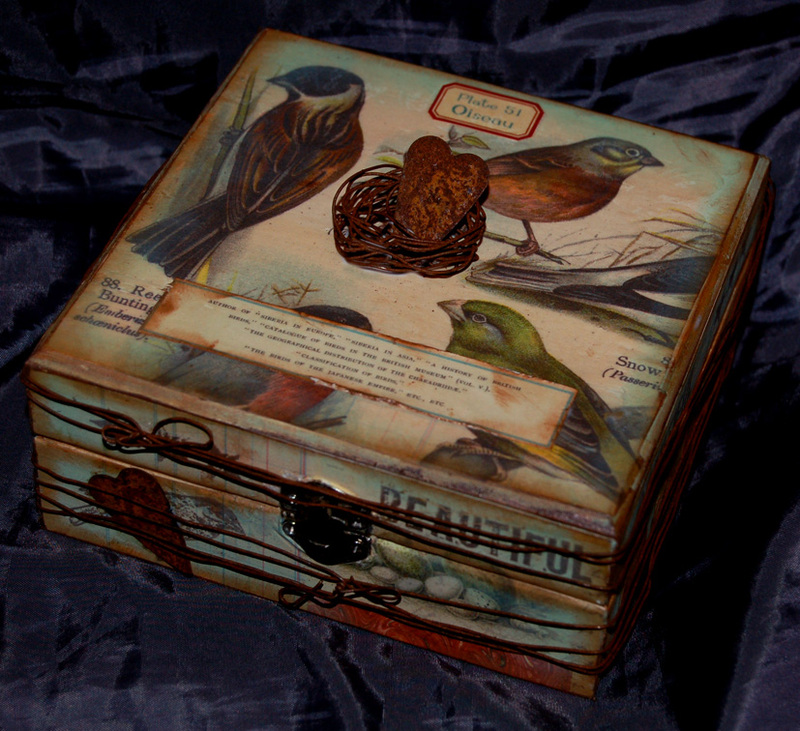 Lastly I added a couple of rusty hearts; one inside the nest and one slipped in behind the wire at the front. This completed the first box. 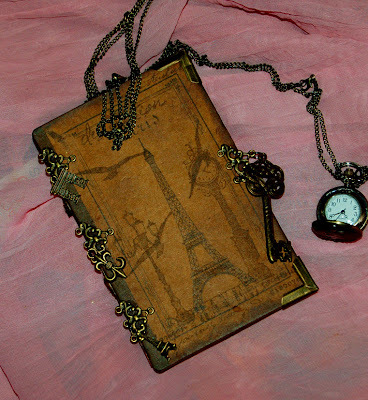 The smaller box was even less complicated... I coloured it completely with the "Sea Breeze" Versamagic chalk ink. then toned the edges the same way i did with the first box, using the "gingerbread shade" and the "jumbo java" shade. I stamped around the edges and on the lid with the same stamp set (7 Gypsies Lille) using a Memento inkpad in "Rich cocoa". As a bolder statement, I stamped on the stars and the word in black stazon. 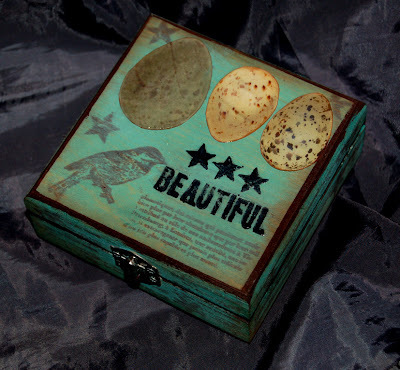 Then using the same paper as on the large box, I cut out some eggs, glued them on and when the glue was dry i put glossy accents on them so they have a raised feel, I also did this to the word "beautiful". 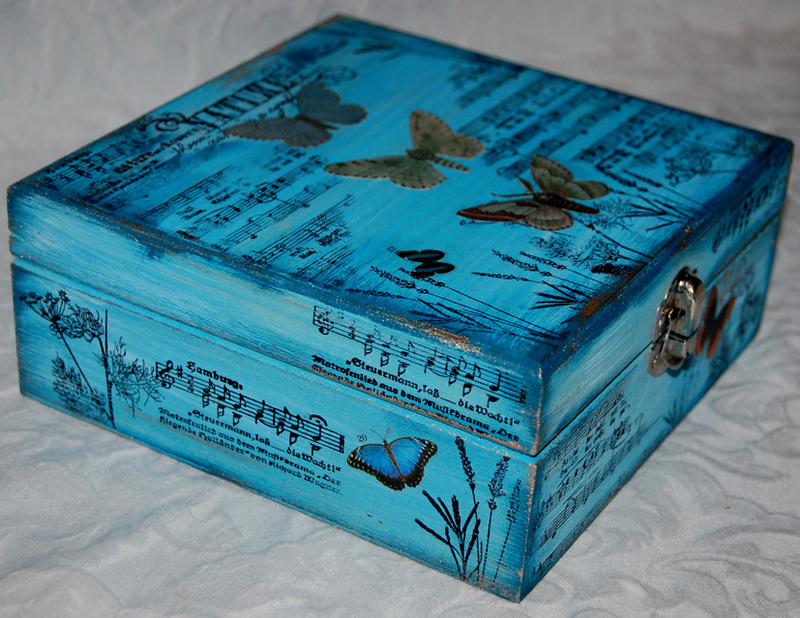 When this had dried, i varnished the whole box to stop seal it and protect the chalk ink. so i splatted some more paint on .. covered bits.. added bits then put on some cut out words from books (The discerning reader among you may be able to pick out Thomas Hardy "the return of the native" and Jane Austen "Sense and sensibility". 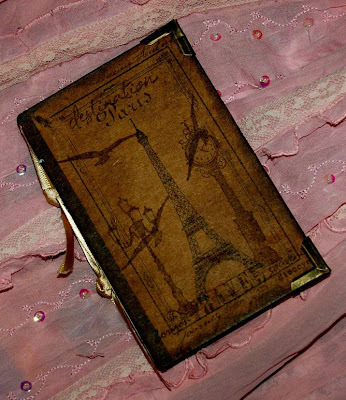 Maybe it does mean something... the more I think about it the more I like it LOL.. I shall stop thinking this instant. Another "work in progress": Tag folder. 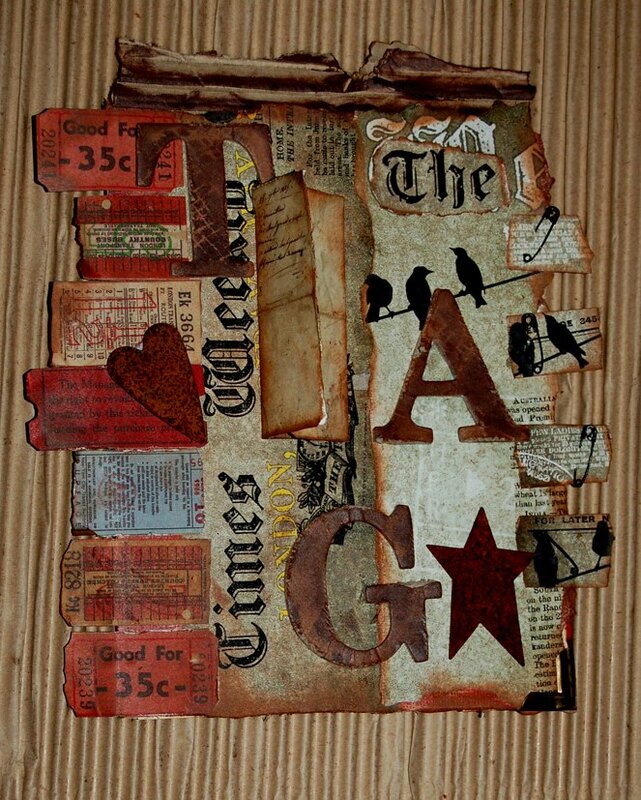 I wanted to make a wee folder for popping tags in to. 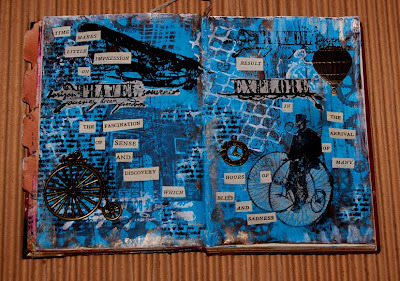 Its been a bit of an organic process, as the original folder didnt look right to me (I dont work well with pink tones). I kept adding things and covering up bits and changing it.... so anyway, this is it so far... I predict more changes. I wanted to use the Kraft-core paper because I wanted to use sandpaper on it to distress emboss the letters on to it. 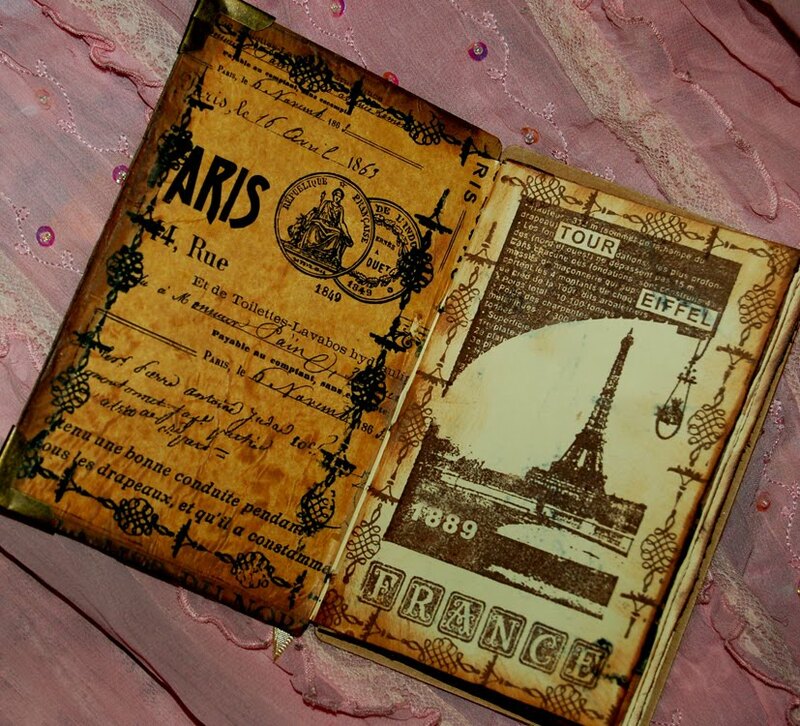 And originally I did, but by the time I added all my layers, you cant see the sanded bits anymore, but I can tell you, it works really well LOL. you can still see hints of it on the inside. 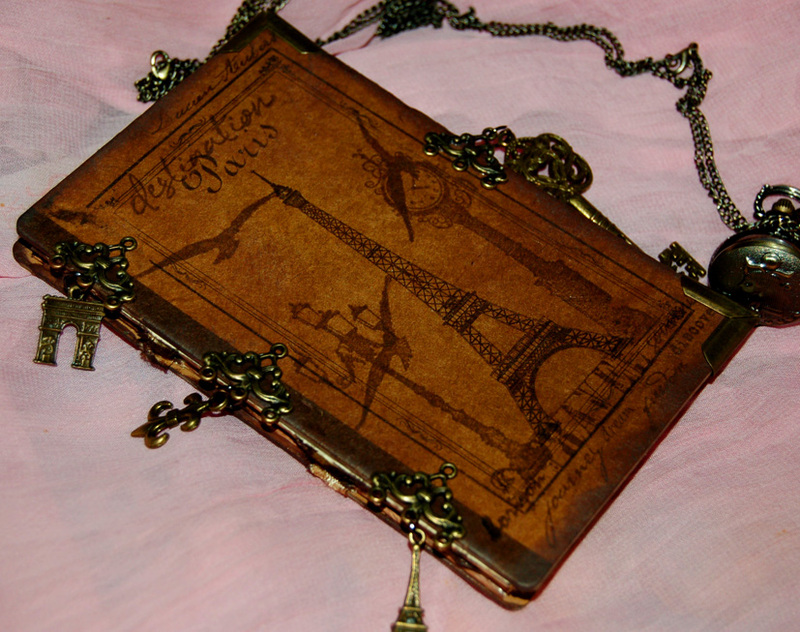 I will make something else with the rest of the kraft-core paper as i really like how well it distresses etc. The following supplies used were supplied by Calico Crafts. I'm in a bit of a rush so not listing there proper names or linking them tot he store, but i will do that later tonight. 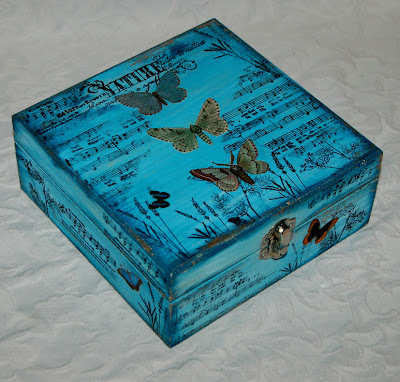 I decorated this wooden box using paint and stamped it using Katzelkraft stamps. 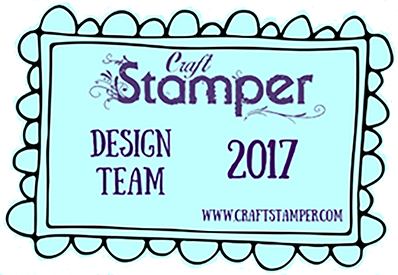 The stamps are available from Katzelkraft HERE; and for customers in the UK they are available exclusively from the Craft Barn. The Box, paint and butterflies are all from Calico Crafts. 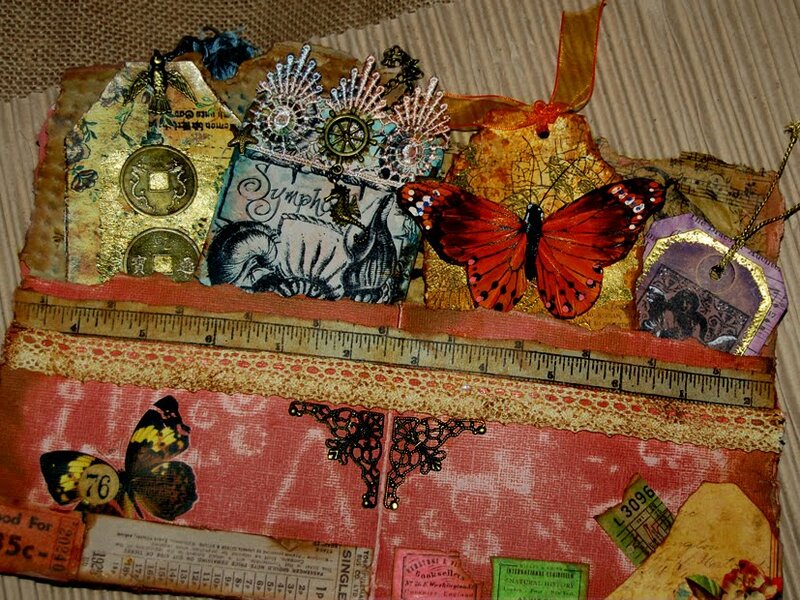 The large butterflies are from 7gypsies scrapbook paper and the smaller ones are 7gypsies rubbings. 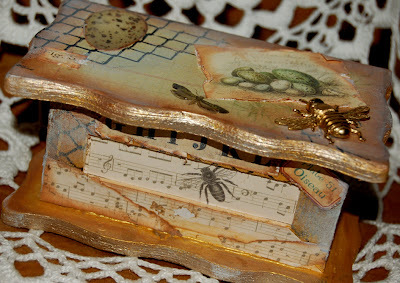 hand book binding: Little notebook. I used the book covers by 7Gypsies as well as some 7 gypsies tissue paper... (available from Calico Crafts) and the stamps are all by Katzelkraft. 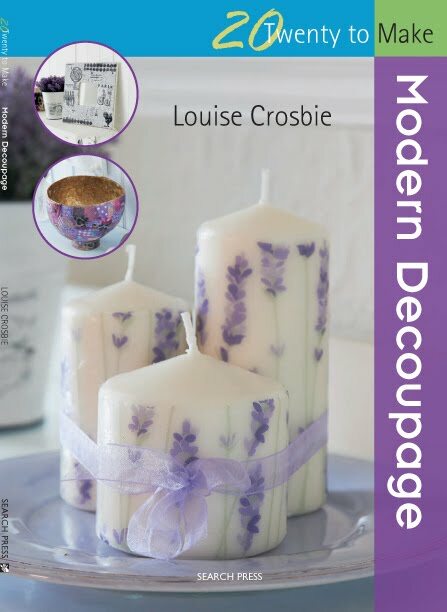 These are also available for UK customers at "The Craft Barn." 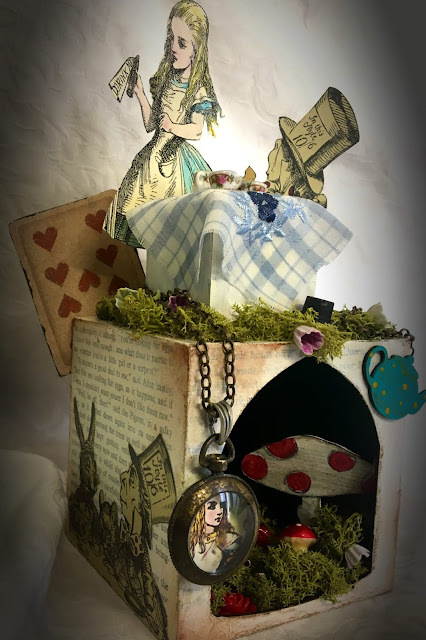 Here is a sneak peek of my piece, for this week, on calico Crafts blog is a pretty Victorian, country lady style, altered gift box. 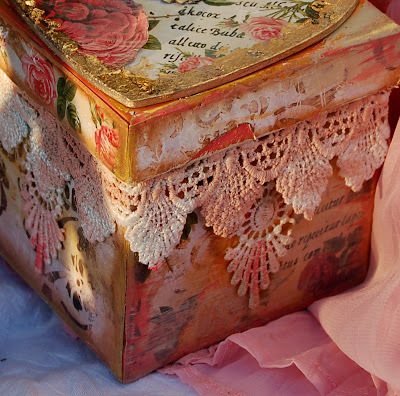 Its reflecting the pretty rose vintage papers and a valentines them using one of the wooden hearts. 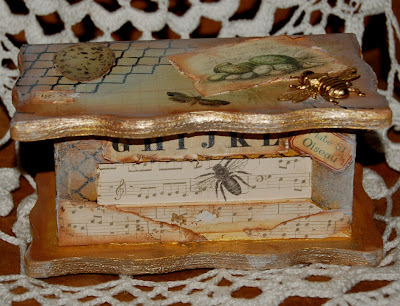 Birds and Bees: little altered box. 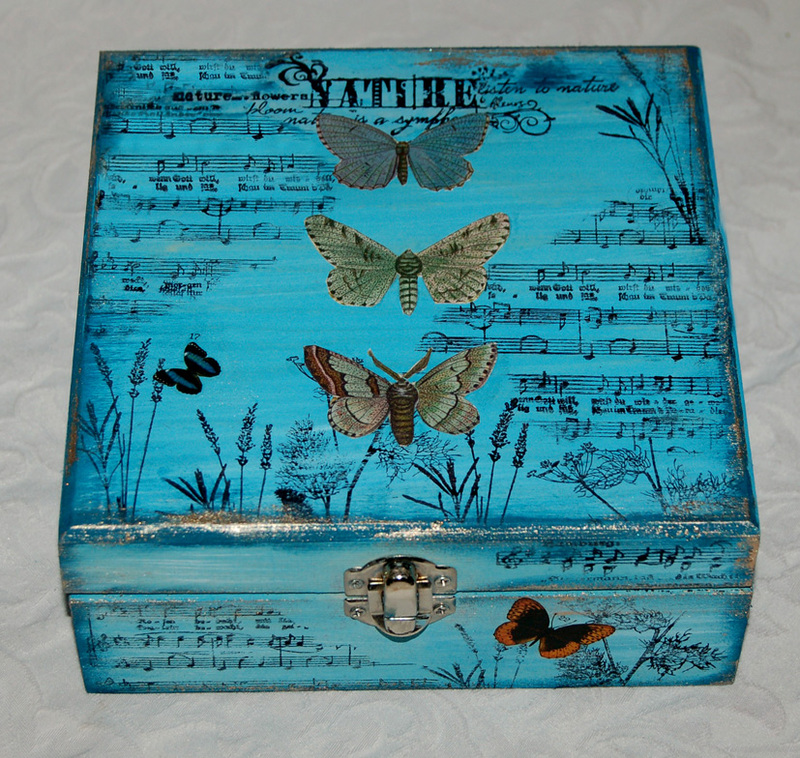 I made this box with items from two of my design teams so I am not using it on either of their blogs. instead its an independent post so I can tell you about the stamp and the other items. Mostly its items from Calico Crafts; Including the box, scrapbook papers, paint, glue etc. 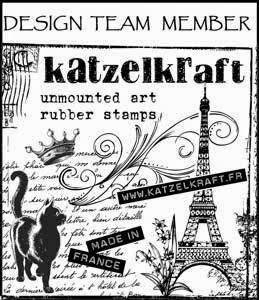 The stamp that looks like chicken wire fencing is by Katzelkraft. 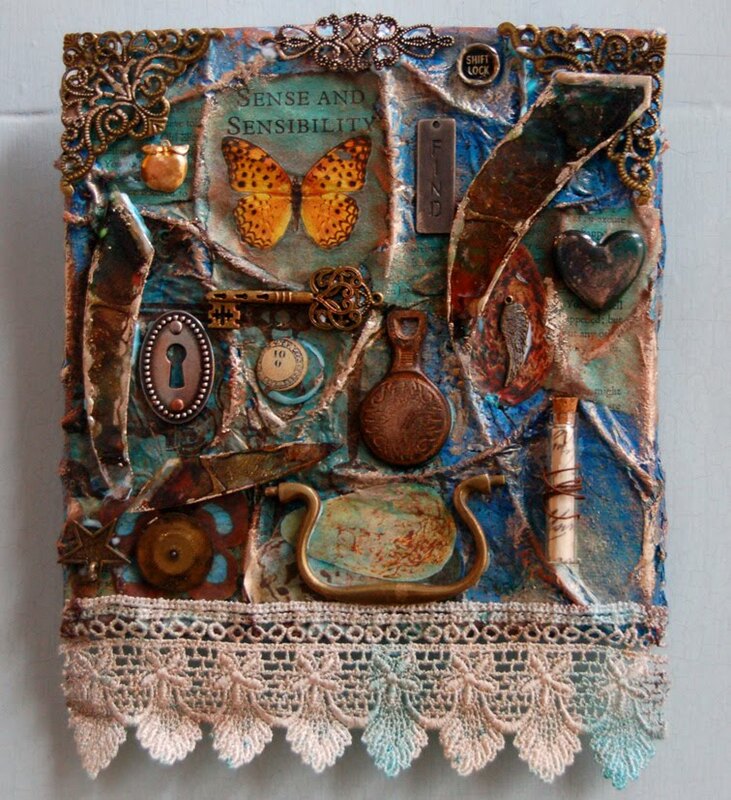 7 gypsies conservatory 12x12 scrapbook paper "Aviary"
Plaid folks art paint (metallic) "Inka gold"
Deco art acrylic paint. "whitewash"